Rotary is "this close" to achieving its goal of a polio-free world, and a wide array of public figures and celebrities have signed on to help Rotary spread the word. Rotary clubs can use the ads within their communities to increase awareness of and support for Rotary’s US$200 Million Challenge , the ongoing effort to raise $200 million for polio eradication to match $355 million in challenge grants from the Bill & Melinda Gates Foundation. Your contribution will help Rotary raise $200 million to match $355 million in challenge grants received from the Bill & Melinda Gates Foundation. The resulting $555 million will directly support immunization campaigns in developing countries, where polio continues to infect and paralyze children, robbing them of their futures and compounding the hardships faced by their families. Rotarians may go to www.rotary.org/contribute to make their online contribution. Rotarians will need to be registered with Rotary's Member Access. Through Member Access, Rotarians are able to access online services and features. Rotarians may register for Member Access at www.rotary.org/memberaccess. NOT a Rotarian? NOT a problem! 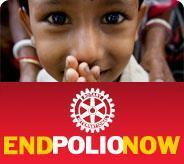 Go here to help Rotary end Polio for all time - www.rotary.org. You can also text Polio to 90999 for a $5.00 donation. If polio isn't eradicated, the world will continue to live under the threat of the disease. More than 10 million children will be paralyzed in the next 40 years if the world fails to capitalize on its $5 billion global investment in eradication. As of 30 September, Rotarians have raised about $147 million for Rotary's US$200 Million Challenge. These contributions will help Rotary raise $200 million to match $355 million in challenge grants received from the Bill & Melinda Gates Foundation. The resulting $555 million will directly support immunization campaigns in developing countries, where polio continues to infect and paralyze children, robbing them of their futures and compounding the hardships faced by their families.